Cookies are such a treat when they are fresh and moist, chewy or crunchy, and just delicious. Conversely, stale cookies that have become hard may look great but are not as appealing to the taste buds. Fortunately, you can moisten your hard, stale cookies before eating them with a few quick revival tips that do not require any specialized equipment. That is, if cookies last long enough in your house to become hard. Slice an apple and place a few slices into the airtight container along with your hard cookies. The moisture from the apple can give new life to the stale baked goods. Store your hardened cookies in a zip-top plastic bag with a slice of bread. Allow the cookies to sit overnight to moisten before eating. The type of bread used, be it white, wheat or multi-grain, does not matter. Moisten hard cookies by steaming them in the microwave. Set the cookies on a microwavable plate and fill a mug with water. Set both items into the microwave and turn the machine on low for 30 seconds to 1 minute. Check the softness of the cookies and steam them for longer periods of time if necessary. Wrap stale cookies in a damp paper towel and microwave them for 10 seconds. 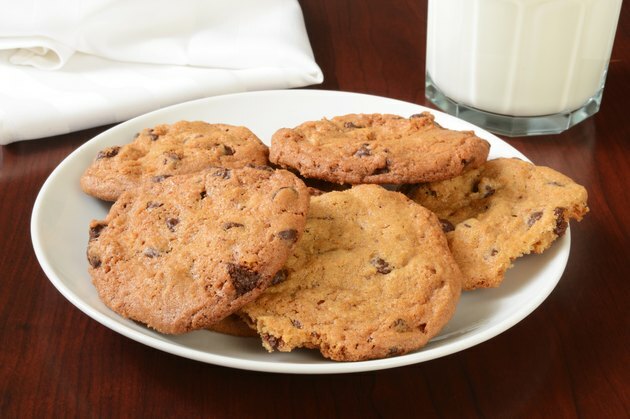 Store fresh cookies at room temperature for up to two weeks in an airtight container to prevent them from hardening.